PWTech Raked Bar Screen: Screening system for large CSOs, wet-weather storage, pump station overflows, or plant by-passes. The Raked Bar Screen is an efficient, reliable and cost-effective screening system for large combined sewer overflows (CSOs). It incorporates a horizontal fixed stainless steel bar-rack and a TIVAR* screen comb. The bars are continually raked by the hydraulically driven comb assembly. Maintenance of the Raked Bar Screen is minimal, and can be performed from the top/clean water side of the screen. Download our product flyer for more information on system operation. 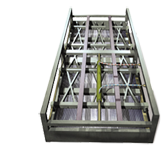 The screen modules are installed horizontally onto the storm discharge weir. Use of horizontally configured screens (as opposed to vertical screens) ensures that all flows, high or low, are screened with minimum velocities through the screen. The entire flow is in contact with the screen, so that the perpendicular flow path screens more efficiently. Horizontal orientation assures equal loading across the surface and thus symmetrical distribution of forces on the cleaning rakes. This minimizes jamming and breaking of comb tines. An ultrasonic level meter monitors the upstream water level. The screen bars are set at the same level as the overflow weir. A level signal alerts the comb to begin its raking operation before the overflow occurs. The flow is upward through the screen bars. The TIVAR combs rake back and forth on a continuous basis to keep the screen face clear. Screenings are retained in the continuation flow. When the water level drops below the overflow weir, the sensor signals the screen to stop. The screen cleans itself, and resets automatically for the next overflow. Contact PWTech engineers for help with system design. *TIVAR is the registered trademark of Poly Hi Solidur, Ft. Wayne, Ind. Copyright © 2008, 2011, 2012. Process Wastewater Technologies LLC. All rights reserved.